Labor Day weekend is over. The traffic has gone. 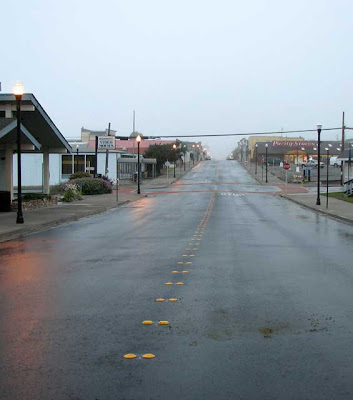 A light rain during the night cleaned the streets. This morning, at 6:55, I noticed the lamps on the east side of Franklin Street were mostly out and the lamps on the west side of the street were mostly on. Why? I know there is a photoelectric cell on each lamp that turns it on or off. The cell is located on the lamp post just below the globe. Maybe the lamp posts on the east side have their photoelectric cells facing south and the ones on the west side are facing north. I started checking and discovered they mostly all face south; the cell on the lamp on the southeast corner of Alder and Franklin faces north! Maybe it was a different batch of photoelectric cells that got installed on the west side of Franklin. I get a kick out of these kinds of puzzles. One more thing to keep an eye on! 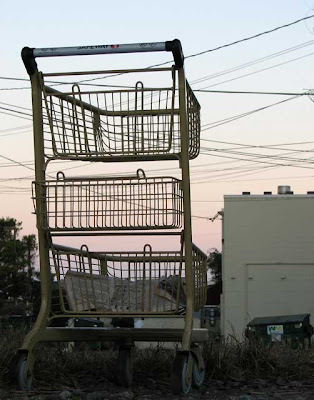 Here is a new style of shopping cart for my Abandoned Shopping Cart photo collection. My thing with shopping carts is, when I see one I try to figure out an interesting composition and perspective. Sort of a self imposed photographic assignment. Sometime I think I am successful, sometimes not. I sort of like this one with the wires of the cart and the wires in the background. Your experience may vary! !